Google, announced the postponement of plans to launch a cell phone in China. This corresponds to a dispute with the government of China on internet censorship and hacking to Gmail recently occurred. 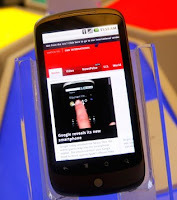 "The launch was postponed," said Marsha Wang, a spokesman for Google Inc, as quoted by AP, January 20, 2010. Initially, Wang said, the procession is scheduled to launch on Wednesday, January 21, 2010. However, Wang reluctant to explain the reasons why the procession was canceled. Wang was also not sure whether the plan was completely canceled or will be reschedule. Meanwhile, on the same day, a spokesman for China's Foreign Ministry said the search giant from the United States that must comply with the laws and traditions prevailing in the country. He also tells about the government advice not to provide a space for Google again to talk about the opinions of Internet censorship..
As we all know, Google recently announced to no longer subject to Internet censorship is a communist country. As ordered, the government of China asked Google to filter search results provided Google.cn. Launch of Google phone in China is a giant search engine's efforts to compete in the China mobile phone corridor, which has great market potential due to the densest population in the world.